The high efficiency separation and thorough entrapment of FOG output that Goslyn™ Separators can provide, enable users the ability to easily manage grease collection and disposal, while also eliminating blockage and overflow problems common to the use of traditional grease traps, interceptors and other GRD's. One important side benefit to the high grade separation of high grade grease and oils that can be produced Goslyn™ Separators, can enable users to create a profit center for the sale of high grade grease and oils to producers of bio fuels and other related products. 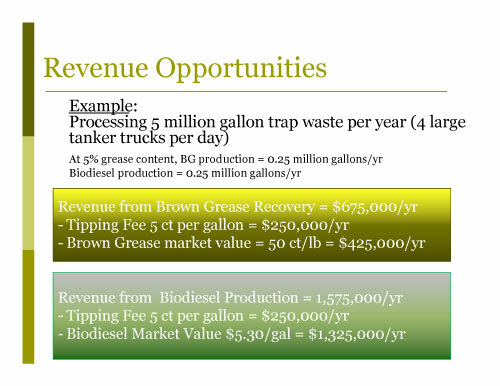 Here is how one California city views potential revenue opportunities that could be generated from the collection of high grade FOG such as produced by Goslyn™ Separators, and converting those organics to Biodiesel and allied derivatives. Goslyn™ Separators connected to sinks will collect a high grade orange or brown grease.